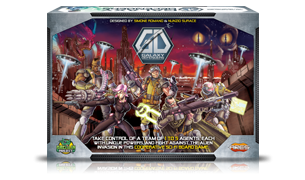 Galaxy Defenders is a cooperative tactical board game, inspired by the classical Sci-Fi movies and video games of the '80s and '90s. In Galaxy Defenders up to five players fight together – each taking control of one or more agents with unique powers – to defend the planet from an alien invasion. The Aliens are controlled by a sophisticated, card-driven artificial intelligence system. The battle for Earth against the aliens develops in a series of missions organized in a story-driven campaign. The Agency prepares to counterattack! 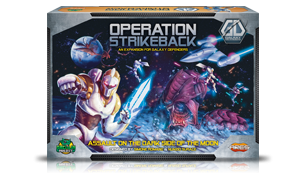 Equipped with new technologies and new weapons, galaxy defenders launch a strike against the alien base on the dark side of the Moon. With the help of genetically modified agents, they will face new alien menaces and terrible creatures. 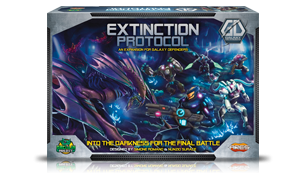 Fight the final battle and save the Galaxy from extinction! The journey begins as the Agents reach the Alien planet. To face their enemy, they must enter darkened caves and corridors, cross underground lakes, travel through alien temples, and face the ultimate challenge in the terrible Queen’s chamber.